A man examines a sawn piece of timber with seaweed attached. Beaches are littered with natural detritus – seaweed, driftwood, or dead sea creatures, which all decompose. Waves and tides concentrate this debris at the high-water mark. Plastic packaging has increased the litter around the coast. Much of this rubbish comes from the land, entering the sea through urban storm-water drains. 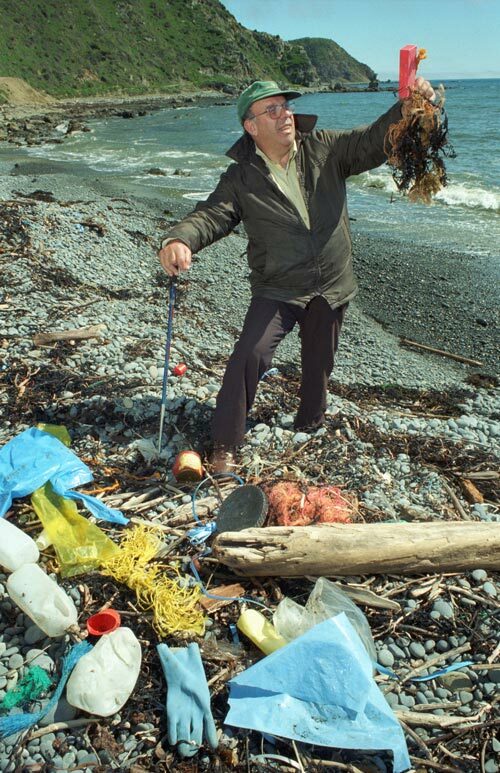 As it is not biodegradable it accumulates, and beach clean-ups are needed to clear it away.